A few days ago, I naively set off to research missionary activity during the Klondike Gold Rush without appreciation for how sprawling the topic was. I had expected to unearth a few quaint tales of starry-eyed young ladies stepping down from atop wagon benches, their hearts aflame and a bible tucked beneath their arms. Instead, I read about reverends, mission schools, reindeer importing, hospitals and nurses. The presence of faiths like Russian Orthodox and Quaker took me by surprise. Prior to the Alaska Purchase of 1867, the Russian Orthodox church maintained the strongest influence in the far north. 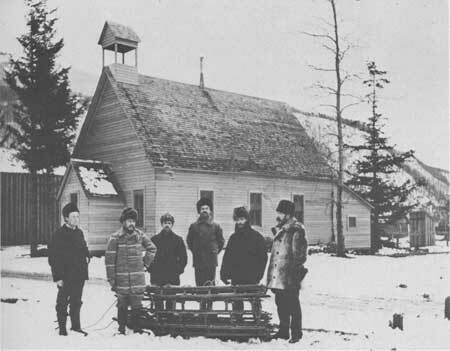 Subsequent Russia selling Alaska to the United States, the Presbyterian church succeeded in becoming the most prevalent faith. 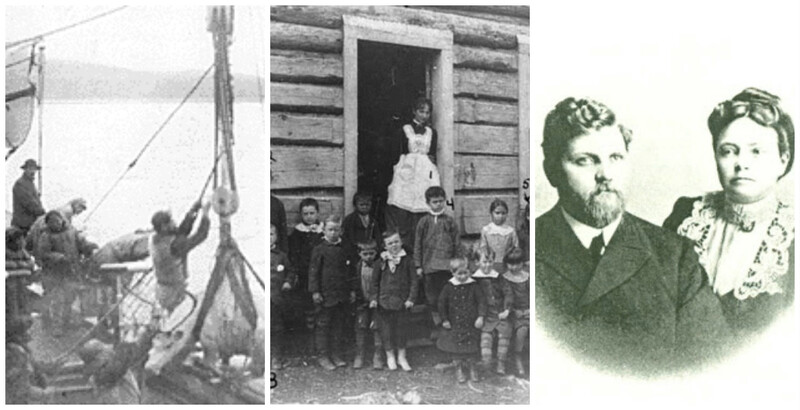 They had ties to most of the mission school attended by First Nations children. 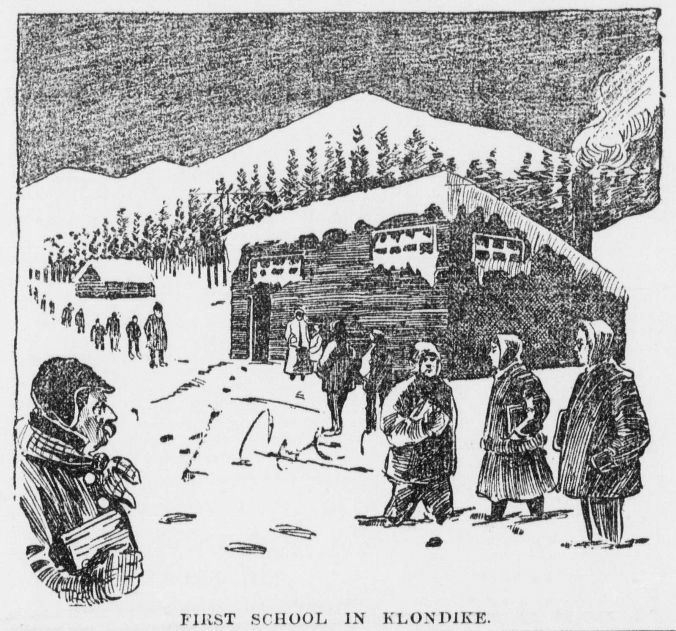 Prior to the gold rush, such schools were the focus of the missionary effort. 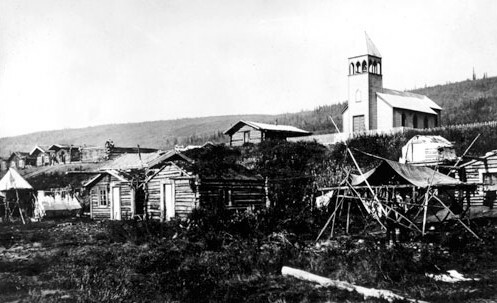 Dawson City can thank the competition between the Protestant and Catholic churches for its initial infrastructure. The earliest churches, hospitals, and shelters for the poor were constructed as a result of their efforts to outdo one another. The variety of dominations reflected the ethnicity of the city’s residents, with the Scandinavians largely identifying as Lutheran and the remaining Russians as Jewish. Having read about the raucous existence of the mining towns with their saloons, brawling, dance hall girls and prostitutes, I wondered how welcome the missionaries might have been. When Presbyterian Robert Dickey arrived in Skagway on October 8, he posted signs around town to announce a church service to be held the following day. Between 70 and 90 respondents attended. He was quoted as saying, “The crowd as a whole looked fairly rough, as if seasoned to hardship, but there was a radiation of warmth and conviviality as our service proceeded.” By October 21 a volunteer committee had secured a building site for his church. In addition, they’d fundraised to cover costs, arranged for donated lumber, a stove, and construction labour. Not everyone enjoyed this positive reception. In a letter to his mother, Reverend Henry Naylor wrote,“I don’t see how any man can remain untainted here unless he is a staunch Christian. Public opinion is so low and sin is so open and religion is so despised that it takes a firm man to stand against it all.” The reverend also commented on a miner he encountered, who “… despite carrying a poke bulging with gold”, was starving to death. Naylor elaborated on the challenges of sourcing affordable food given the minimal fixed income of a Christian missionary. 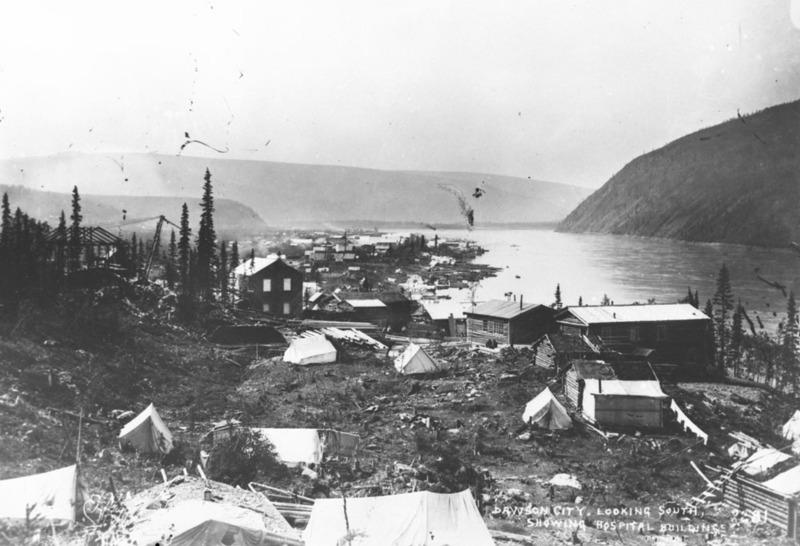 In the summer of 1899, The Sisters of St. Ann, arrived in Dawson. They’d been asked to come and run the city’s first hospital, St. Mary’s. The hospital was a two-story log construction, measuring 16 x 7m. After the 1899 death of Father Judge, who originally solicited their services, the sisters took over full operation of the hospital. They added a third floor and a new wing. The construction was funded through donations and the sale of hospital insurance which thy dispensed in the form of tickets. In the earliest days, the hospital was staffed with three nurses. With minimal equipment and medical supplies, they treated typhoid, pneumonia, scurvy, frostbite and an assortment of mining injuries. I’ve indeed been inspired by what I’ve learned through this research. After discovering a photo of a very stern-faced woman and another of a group of temperance supporters, I wondered how such women may have felt about the more colourful women in their community. What was the tolerance level of prostitutes and female prospectors toward organized them, in turn? A narrative poem is formulating in my mind; one that would view life in the Klondike through the lens of someone guided by a strict moral code. Is there something you’d like to share? I’d love to hear from you. Very interesting post. I wouldn’t have expected Russian Orthodox either. I found the list of necessary clothing for a school teacher curious. I wonder what a Balmoral and an Ulster is. Thanks for visiting, Cryssa! I suspect these items of clothing were intended for the comfort of the teachers. An Ulster is a long overcoat. A Balmoral is a stiff petticoat/underskirt. From what I’ve read, it elevated the skirts above the ground so the lady could partake in physical activities. 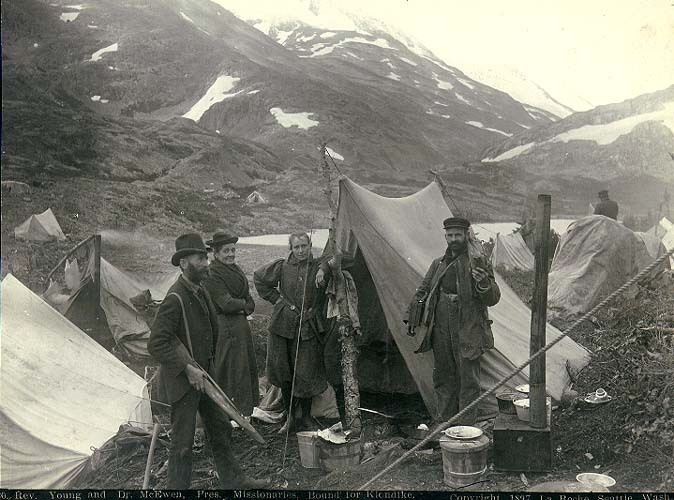 There was a lot of hiking and rigorous activity involved in reaching Alaska and the Yukon. Once the romantic focus of writers like Robert Service and Jack London, this part of North American history is largely overlooked in recent times. Yet its history is our history, and in many ways, the backbone of our formation as a modern society. The hardships, the stubborn dreams, the realities of frontier living create many poignant stories. So beautifully expressed. I find these gems of history so fascinating. I didn’t know that there were residential schools in Alaska in the early 1800’s. Some histories involve firsts, like M.A. Healy,the first man of African-American descent to captain a ship. He collaborated to introduce Siberian reindeer to the west coast of Alaska to save the starting First Nations people. Healy made five separate trips to bring a herd of around 175. He and his team were heroic. I’m feeling inspired now to pick up some Jack London or Robert Service! 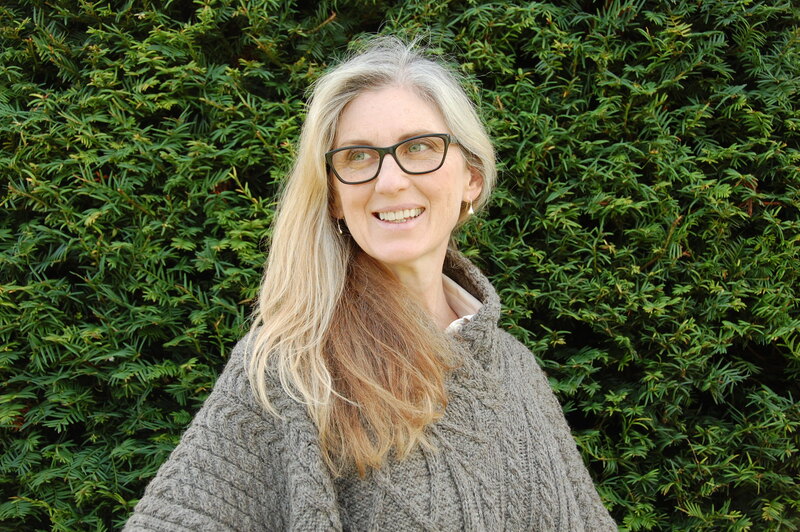 Gwen, nice story and images.